The perfect accessory to any man's wardrobe is the leather cuff glove. Stylish and functional, leather gloves go great with any outfit and are the perfect finish once the weather gets colder. Leather gloves are the perfect stylish compliment to any outfit. Leather gloves are ideal for keeping your hands warm on cold days and are very versatile since they are not as bulky as fleece or knit. Leather gloves can be worn while driving and still provide you with function and ease. Leather can also be worn while riding motorcycles since the material will serve as a protective barrier to your hands. Some gloves may be lined with cashmere or polyester, while others come unlined. By choosing a leather cuff glove, you will have added protection against wind, rain or snow. The cuff prevents wind and moisture from going into the glove, and keeps you dry at all times. Cuffs can vary in materials and in length depending on what function you want the glove to serve. A knit cuff will provide comfort and a snug fit across your wrist whereas a gauntlet cuff will protect your wrist and forearm since it is longer in length. Some cuffs are more decorative and fashionable while others are more functional. Cuffs can be elastic or have Velcro or snap closures. Choose your glove depending on your particular need and style. For a luxurious and stylish glove, try Blue Fly. They feature Gucci's black leather cashmere cuff gloves, which are suede trimmed with a supple leather exterior. They have a notched cuff with ribbed cashmere and are fully lined in cashmere knit. At Leather Up, you can find a wide range of gloves with varying cuff lengths. Check out their gauntlet soft lambskin gloves with a long cuff by Xelement Gloves. They have a micro fleece lining and adjustable Velcro closure. Macy's features Polo by Ralph Lauren Italian leather quilted racing gloves. These gloves have a quilted construction and an adjustable strap across the wrist. They are not only fashionable but functional as well. They come in black and brown leather. Shopping for men's leather gloves can be simple if you know your proper glove size. If shopping in person, try on several sizes until you find a comfortable fit. Be sure to know your size if you plan on ordering gloves online. Men's gloves come in sizes small through extra-large. 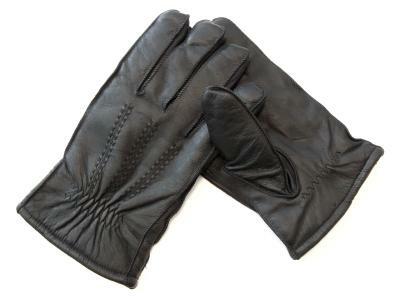 Just like any other leather items, leather gloves need special care to keep them in their best shape. Always wipe off any visible dirt after wearing your gloves and clean and condition them as needed. Be sure when storing your gloves that they lay flat so you don't get any wrinkles in them. Always let your leather dry naturally and keep your gloves away from direct heat. With proper care and maintenance of your leather gloves, they can and will last you for years. Remember that higher quality leather gloves will wear and last longer than a cheaper pair.